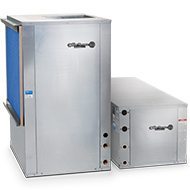 The Versatec Base provides a true value product line to the commercial water source heat pump industry. This product is engineered to offer high efficiency operation while maintaining a small cabinet footprint and an impressive list of value-added features. With its compact design and ability to perform optimally in both water loop and geothermal applications, the Versatec Base is an ideal solution for both retrofit and new construction applications. The Versatec Base model exceeds ASHRAE 90.1 efficiencies while utilizing environmentally friendly R410A refrigerant. It is available in a wide selection of capacities (005 - 017 kW output) to offer unmatched application flexibility and offers many optional features for convenient customization.